What Mailchimp Triggers and Actions are Supported? New Subscriber - Triggers when a new subscriber is added to an audience. New Subscriber With Tag - Triggers when a subscriber is added to a Tag within an audience. New Unsubscriber - Triggers when any current subscriber unsubscribes from an audience. Updated Subscriber - Triggers when a subscriber is added or updated in an audience. New Audience - Triggers when a new audience is added to your MailChimp accounts. New Campaign - Triggers when a new campaign is created or sent. Create Campaign - Creates a campaign draft. Send Campaign - Sends a campaign draft. PLEASE NOTE: This action sends an email to everyone signed up to the Campaign. Are you trying to send an email to just one person? Set up an Automation within MailChimp and assign the welcome email to a tag. Then assign that tag to your customer with the Add Subscriber To Tag Action. Unsubscribe Email - Unsubscribe an email address from an audience of your choosing. Add/Update Subscriber - Add a new subscriber to an audience of your choosing. Can be used to update an existing subscriber too. Add Subscriber to Tag - Add an email address to a tag within an audience. Note: the email address must already be subscribed to the audience, or this will fail. Find a Campaign - Finds an existing campaign. Find a Subscriber - Searches for a new subscriber on your MailChimp audience. Admin/owner permissions - there are no restrictions on what team member you must be to access Mailchimp's integration features. 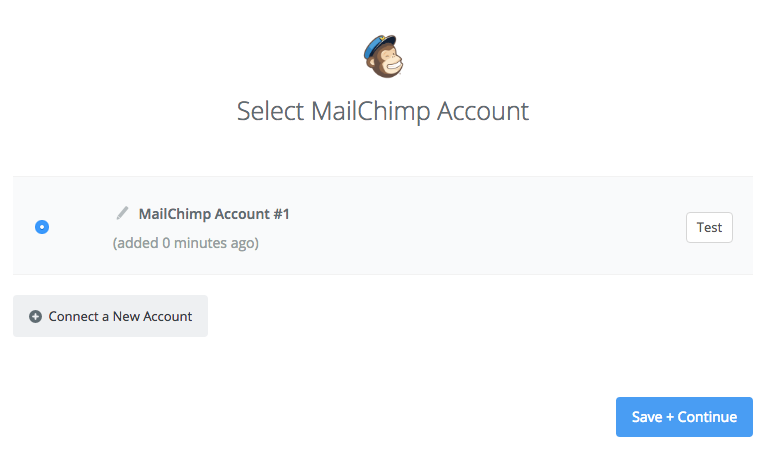 Paid/versioned account - you can be on any plan to access Mailchimp's integration features. Custom field support - Yes! You can use merge fields in Zaps. You should then get a pop-up window from Mailchimp asking you to log-in to authorize the connection between that Mailchimp account and Zapier. After logging in, you'll get sent back to your zap where you now have your Mailchimp account connected! 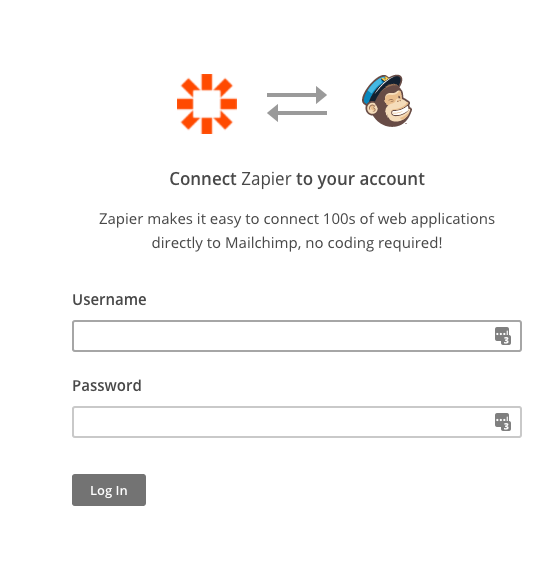 After you have a username and password, you'll be able to log into your MailChimp account when trying to connect it to Zapier to ensure that connection is made. If your MailChimp list has double opt-in enabled, you won't see any subscribers added by your zap until after that new subscriber clicks through the double opt-in email. However, your task history will show a successful task immediately, even if the subscriber does not confirm the double opt-in email. MailChimp checks for duplication based off email address, so any email addresses your zap is trying to add that already exist in that list will have a "halted" status in your task history. If you want to update the subscriber, you need to change the Updated Existing field to "Yes." If someone was subscribed to a list, then unsubscribed, and later was added back to the list, the zap will not trigger as it sees it as a duplicate from the first time they subscribed. Unique email addresses will only be sent once. If you are seeing this error it means you don't have interest groups enabled. See this tutorial on how to get enable it. If the field is mapped, this likely means that the sample record from your trigger data didn't have anything populated in the email field. While the field is mapped correctly, there is no data being sent in the email field, which causes an error. To fix this, go into Pipedrive and create a brand new person with an email filled in. 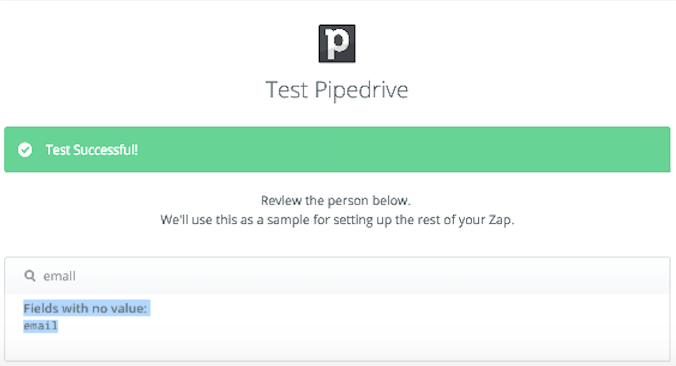 Back in Zapier, click "Re-test Pipedrive to get another person" and then finish testing the MailChimp action. Same thing would be applicable to a different app and trigger. It takes two Zapier action steps to accomplish this. First, add a Create Campaign action step to your Zap and follow the instructions to set it up. Then, add a Send Campaign action step to your Zap. For the "Campaign" field in this step, select "Use a Custom Value" and then pass in the ID that was returned from the Create Campaign step. Given MailChimp's current action template, you are currently required to choose a Group when setting up a New subscriber action. You can then map out the output of the Formatter step and use that as a custom value for the MailChimp Groups. Once you are able to pass on data in the proper format, the Zap should proceed properly and dynamically place people on the groups. It probably came from a different integration. When using the action "Create/Update Subscriber", there's a setting that lets you specify how groups/interests should be handled if the subscriber already exists in your list. Add Only - any groups/interests specified by your Zap will be added to the subscriber. Replace All - all of the subscriber's existing groups will be cleared, and only the groups selected within your Zap's setup will be added. 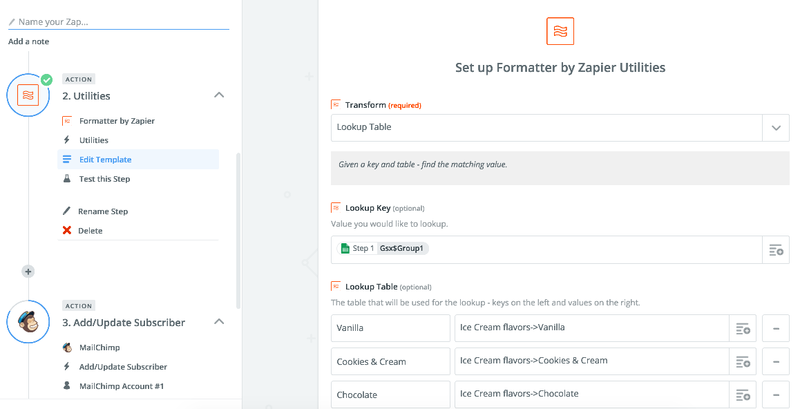 Replace Matching - clears/replaces only the groups that are specified by your Zap. 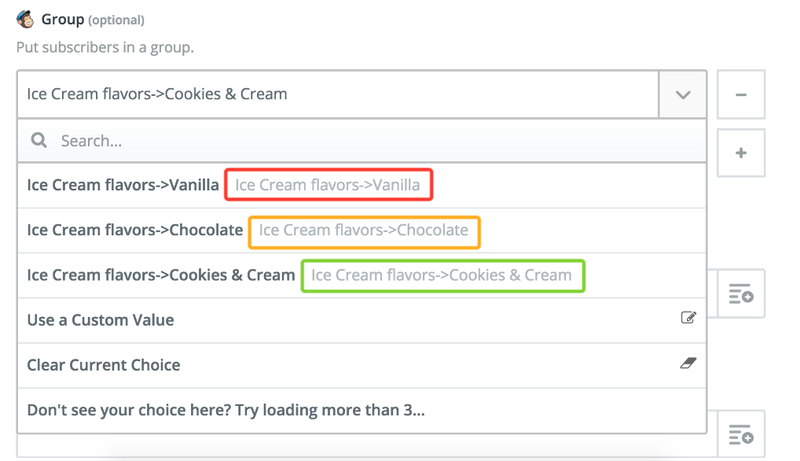 A Zap is configured to add the group/interest "Ice Cream -> chocolate". Add Only: Results in "Pizza -> cheese", "Ice Cream -> mint", and adds "Ice Cream -> chocolate"
Replace All: Clears the subscriber's groups, and results in just "Ice Cream -> chocolate"